Honestly, I always thought that the decals on Advan rims were printed. I was wrong. Only after a couple of months after I got the RGIIIs did I finally find the time to painstakingly have those decals put on. Come on Advan! Have them decals done for me out of the factory, please! That aside, I love the Advan RGIII. 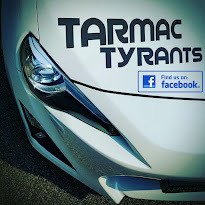 The racing hyper black looks really good on my white Toyota GT86 and the six spoke design makes it easy to clean with good sponge access. The rims are around the 8kg (17 pounds) region, relatively light for the 18 inch GTR and Super GTR designs. As a bonus, the rims come with black valves and valve caps! Some say that performance drops will be expected due to the heavier rims but honestly after some months of driving, I can only say that nothing very much has changed if you have ECU and exhaust mods. Even with the larger 355mm rotors and my 6 Pod AP Racing CP9040 calipers, my throttle response seems satisfactory. The only price to pay is a marginally higher fuel consumption rate but that is expected when you get better grip from the wider tyres. While the Advans are not the cheapest rims in the market, they are not the most expensive either. 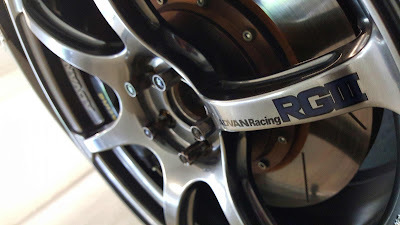 Granted that there are some really awesome forged designs from Volk Racing that I was seriously considering but I went for the Advan based on cost, ease of maintenance and aesthetics.